Piano Song Lessons - Learn the Charlie Brown Theme Song! Today we are going to finish up the Linus and Lucy lesson we began earlier. Before you proceed, you should make sure that you have both the left and and the right hands parts down to second nature. It is very important, because when you try to play both hands together, one hand has a tendency to try to mimic the other. If the muscle memory is ingrained into your hands, it will be much easier to resist this tendency. The key to playing both parts at the same time is to take it very slowly at first. It will take some time build up speed, but you should be patient with the process. The more songs you are able to achieve left and right hand independence on, the easier it will become for you. Once you have the first first part down, we can learn the next part. The first part gets played through twice in its entirety. Compared to what you just learned, this next part is very simple. It is a simple riff consisting of three hits of a D flat chord in the first inversion (F, A flat, D flat), then a single E flat chord. The right hand plays the full chords and the left hand plays octaves of the root. After this build up phrase, the right hand gets to show off a little. The right hand plays alone for the 'answer' to the build-up phrase I taught you in the last paragraph. You are going to want to move your hand an octave higher, and position it as though you were going to play the D chord in that position. Then you are going to play what is called a ghost note on the E flat key with your second finger. A ghost note is a note that is played very quickly, before moving on the the next note. That next note in this case is the F key. 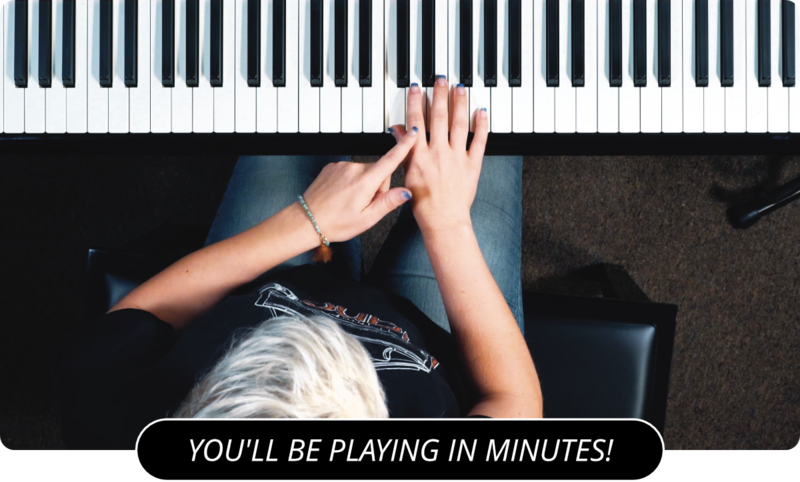 As you play the E flat note with your second finger, let your second finger slide off of it quickly and hit the F key with your third finger. Hit the F key again, then repeat the combination twice before ending the riff by playing the E flat and the A flat together. So it goes E flat, F, F, E flat, F, F, E flat, F, F, E flat + A flat. Watch the video or listen to the recording to get the timing right. It sounds like a really hard and impressive riff to play, but it's actually fairly easy! Now you know how to play most of the Charlie Brown theme song. Play the call and response pattern that I taught you in this lesson three times before going back to the first part of the song that I taught you in the last lesson. When your left hand goes back into the riff from the beginning on the song hit a C note with your right hand. That's it for this lesson. If you listen to the recording, there is a part where he takes a solo and really just starts jamming out. He's a great piano player and you shouldn't expect yourself to be able to follow along at this point. You can however use the past lessons that I've given, and your knowledge of the chord structure of the song, to create your own melody for an improvised solo. Thanks for reading, and I hope you were successful in learning Linus and Lucy on the piano. Watch Part 1 Of The Charlie Brown Theme Song .